Without trying, you put your body to the test every day. You sit in your car during your morning commute, followed by more sitting at work, not to mention the hours you spend peering into your smartphone. Over time your body adapts to this “hunched back” position leaving you looking like a dead ringer for Quasimodo. Ready to restore that upright posture? If you have been in a gym or worked with a trainer, you have most likely seen or used the round cylindrical foam tool known as a foam roller. 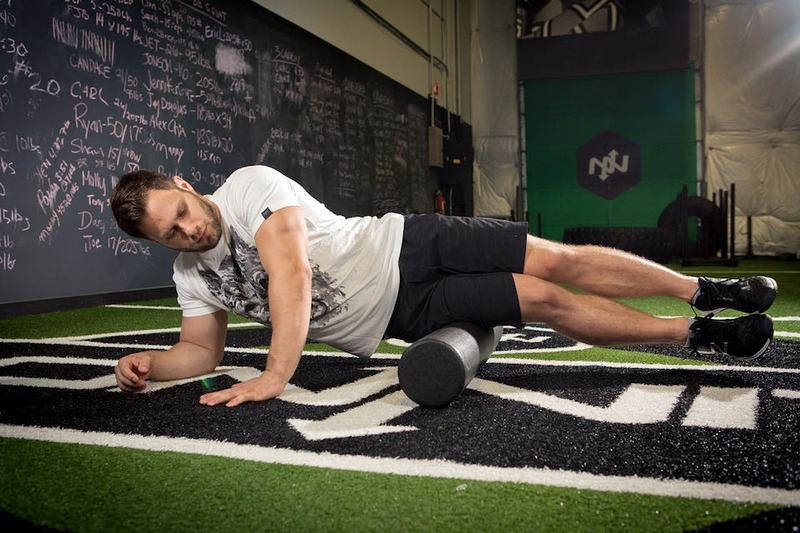 As with any tool or piece of equipment, there is a wrong and right way to use a foam roller. When used properly, the benefits to you are numerous. It can help prevent injuries, aide in recovery, reduces pain and muscle tightness, and even strengthen your core. 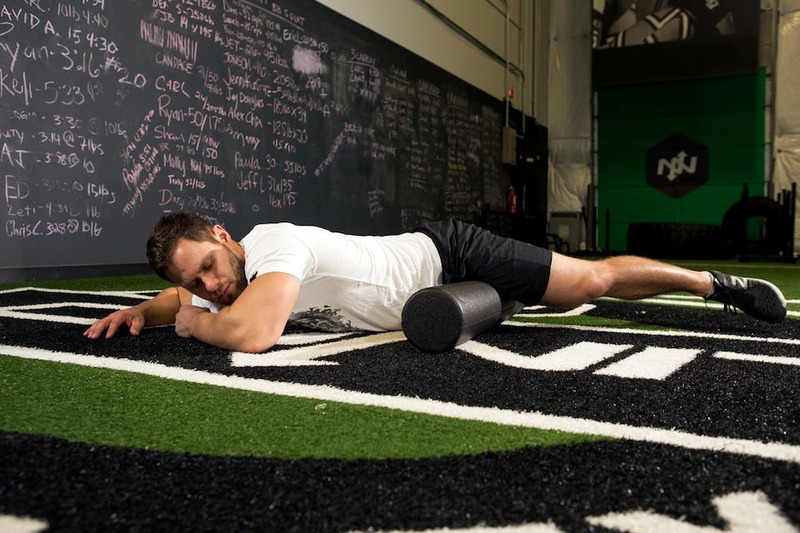 Before we get started on the five best foam rolling exercises, I want to point out a couple of important “rules” that apply to every foam rolling exercise you can do. First, remember to breathe; it sounds simple, but when you hit a tight spot or a “knot” in the tissue, you tend to hold your breath and tense up. Breathing brings oxygen into the blood stream which is vital for muscle recovery. Relaxing while breathing helps the muscle open up and the benefit will be greater. Second, stay off the joints and ligamentous tissue. When foam rolling on muscle, it increases blood flow to that area, hence the aid in recovery. Staying off joints and ligaments, which are solely for function and structure, will assure you do not injure yourself and reap the benefits of self-massage using a foam roller. Here are the 5 Essential Foam Rolling Exercises to help keep you moving. It doesn’t matter if you’re a computer jockey or a mixed martial artist. Do these as frequently as possible or before or after exercise. Start with either the right or left quad. When foam rolling the quads you want to place the foam roller just above the knee and roll up to the hip; long slow passes up and down. If you come across a particularly sensitive area or knot, stay on top of it for 30 seconds and remember to breathe and relax into it. After the 30 seconds, the area should start to open up. Once you have spent around two minutes on one side, switch to the other and repeat. Rolling the quads can help loosen the patella tendon which helps prevent tendonitis and pain around the knee cap. AKA the gastrocnemius and the muscles surrounding it are quite possibly the most overlooked group of muscles when it comes to recovery and soft tissue work. Most people I know jump off the ground when they are first introduced to a foam roller on the calves.I know I did when I first attempted it. If you run, hike, fight, lift, or a mix of all of them, these puppies are firing. It is very important that you give some foam rolling love to these muscles. Doing so can keep the ankle joint mobile and also save the achilles tendon from rupturing. I’ve seen it happen and that’s a tough injury to come back from. When rolling the calves, start with your calf on top of the roller and then cross your other foot on top to create a little more resistance and pressure. Planting your hands behind you, lift your hips and start to roll up and down. Spend roughly one minute on the inside of the calf with foot rotated in. Spend another minute going up and down the middle with your alternating from dorsiflexion and plantar flexion. Spend a final minute on the outside of the calf with your foot turned out. Remember to pause on sensitive areas to help release the knot. Slow and steady. When done with all three minutes, switch feet and repeat. The IT band is a longitudinal fibrous reinforcement of the fascia lata, that runs down the outside of the thigh from the hip to the shin. It helps stabilize and move the knee. The benefit of foam rolling your IT bands will help prevent ITBS (iliotibial band syndrome), which can help alleviate and release the pain associated on the outer side of your knee as well as pain on the bottom of your foot. This can happen after running a lot of miles or even after a lot of squats and lunges. Now when we are talking about rolling the IT band, I want you to think about the second “rule,” never foam roll directly on the IT band. So how do we roll the IT band? We roll the musculature that surrounds it; the anterior side (front side) and the posterior side (back side). 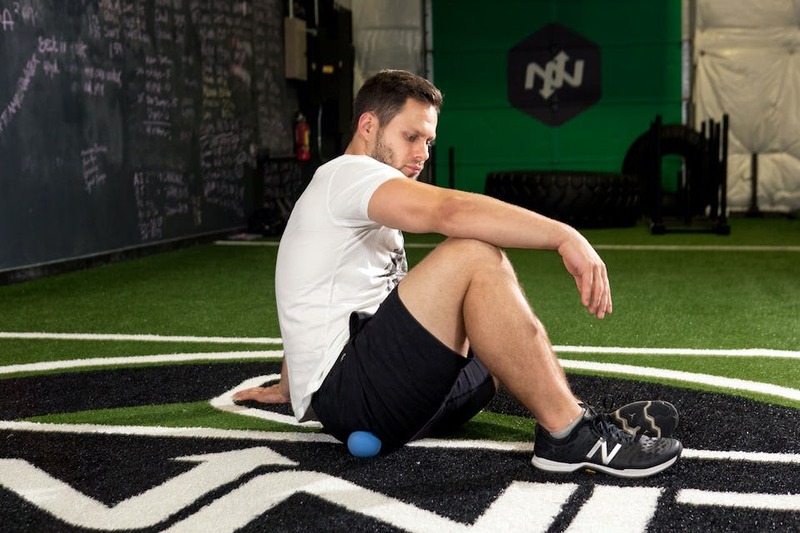 When rolling the anterior side, you will start in the same position as when rolling your quads; then you will shift your body to the outside but not directly on the IT band. Roll up and down from the top of the knee to the hip. Again, stopping on any sensitive areas or knots for 30 seconds to open them up. Sometimes the IT band area can be the most sensitive and painful. So find the right foam roller for you; they come in many different densities. After two minutes on the anterior side, you will switch to the posterior side of the IT band. Sitting on your bum, place the roller under your leg or on the hamstring. Then place your hands behind you to create support and lift in the hips. Turn your leg to the outside and off the middle of the hamstring. Then proceed to roll up and down, avoid rolling the back of the knee and stopping on any sensitive areas. After two minutes, switch legs. Foam rolling the T-spine can be very beneficial for the desk jockey hunched over his desk or the mixed martial artist who is in a constant guard position. It also keeps the T-spine mobile and in proper alignment. When setting up to roll the spine area, you want to keep in mind the thoracic spine is the middle back, from the tops of the shoulder blades to about half way down your back. Imagine your belly button is on your back, you would want to stay just above it. Place the roller behind you and start with it just under your shoulder blades. Cross your arms as if you were hugging yourself and while keeping your midsection tight, lift your hips off the ground and head neutral, slowly start to roll up and down continuing to breathe. After 45 seconds lift your hands over your head for a slightly different angle, continuing this slow up and down movement. After roughly 90 seconds – two minutes, you’re done. One benefit of rolling the glutes is relieving tension in the lower back which I believe everyone can relate. When rolling the glutes, you want to start off with sitting on the foam roller and placing your hands behind you for some support. Leaning towards the glute and hip, start to make small passes up and down. It’s not a very large area so maybe only rolling no more than six inches. To increase the surface area, cross your leg over your knee in a figure four pattern. When in this position, lean to the side of whichever leg is crossed and roll up and down. Roll two minutes a side. SMALL WARNING: If you feel a nervy sensation, be sure to move off of it. You can continue to roll the glute area, just avoid the nerve. Now that you have covered all the basics feel free to implement these into your warmups, cool downs, or even just as a daily routine. When done regularly, you set yourself up for less injury and more opportunities to continue the sport you love! Foam rolling, and/or pressure point release modalities should not be savage. Nothing gained by “attacking” the muscles, etc. FR is recuperative, not a means to make “gains”, or set records. And the time spent shouldnt be more then a few minutes at best. When you attack you cause the myofascia to contract and over time that becomes its default reaction. 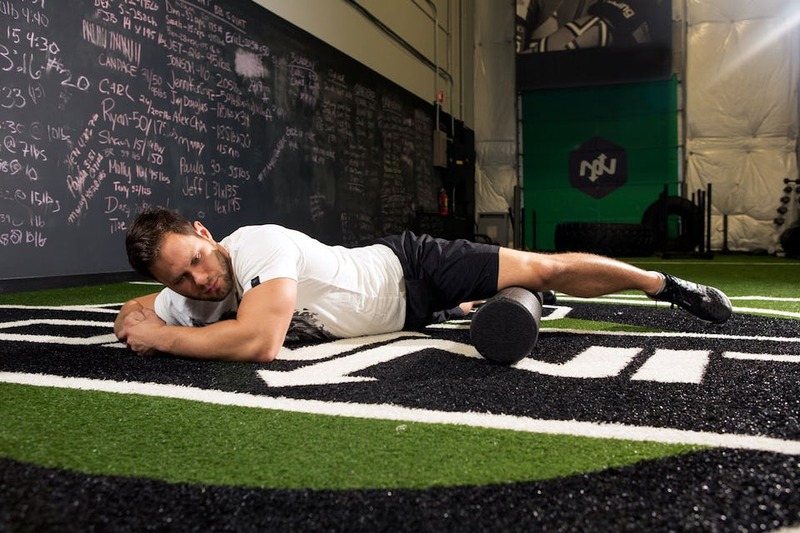 Does Onnit plan on releasing their own foam rollers? you can totally go perpendicular to the spine, you just have to be careful. a softer roller or more bodyweight support at first to warmup and loosen up the superficial muscles (lower traps, lats, rhomboids) by working from the midline out to the sides. then it’d be fine to roll perpendicular to the spine. when you get a massage, one of the most common things a deep tissue massage will consist of is a deep elbow drag up the muscles that go from your hips, along your spine and to your neck. again, much like a massage therapist you just gotta go slow and pay attention to what you’re getting into. Is this good if your legs are sore? Good for a lung run maybe?